Few fashion trends speak as loudly as black nail polish. Instantly labelling its wearer "goth" or "punk", black nail polish is rebellion in a bottle. Black nails have not always been a sign of an anti-establishment agenda. In fact, jet-black nails used to speak of royalty and lavish living. In ancient China, nail color was used to signify social ranking, with mere commoners enjoying shades of pink while the royals used red and black. In the centuries that followed, popular nail colors ranged from sweet pastels to raging neons, but black was relatively unheard of. Then, in the seventies, rockers such as David Bowie and Freddie Mercury resurrected the look. On the hands of these hard rocking males, black nail polish took on a whole new meaning. Now the color symbolized a nose thumbing, laissez faire mentality, and a generation of rockers soon adapted the trend. Fast forward to the nineties, and black nail polish is a symbol of the gothic movement. Shock rocker and goth king Marilyn Manson once again popularized jet-black nails. While black nails are still enjoyed by goths and punk rockers, the color has also become more mainstream in recent years. Stars such as Lindsay Lohan, Jessica Alba, and Nicole Richie have been photographed on the red carpet sporting black nail polish along with their high fashion frocks. This creates a look that is reminiscent of a bad girl, but is still pretty and fashionable. Big name designers, such as Chanel and OPI, are now offering their own versions of black nail products. Black nail polish is a little more difficult to wear than more traditional nail colors. Since black nails are often attributed to various subcultures, you must think about what look you are trying to achieve. Do not wear black clothing. Wear simple jewelry. Let your black nails be your main accessory. Black tends to look classiest on short, well-manicured nails. Extremely long or obviously fake black nails simply look scary or costumish. Very dark nail polish attracts attention and requires a bit of confidence. If you prefer to be a wallflower, skip the black. Regardless of your reasons for wearing black, you'll want to take proper care of your nails. Nothing looks tackier than chipped black nails. Because the color is so severe, black tends to highlight problem areas. Be sure to keep your nails clean and filed, and repair chips or cracks as soon as possible. 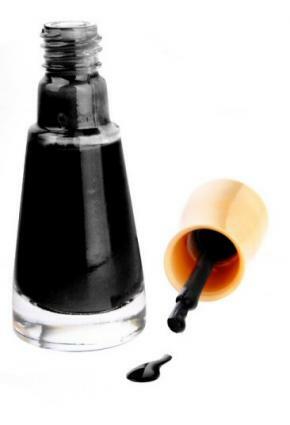 Black nail lacquer is one fashion area where you really do get what you pay for. While designer nail polish can be pricey, the results are well worth it. Some brands to try are Chanel Black Satin and OPI Black Oynx.